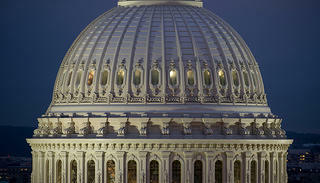 This close-up look at the Capitol dome shows the intricacy of its architecture. We chatted with Joe Abriatis, an engineer and construction manager at the Architect of the Capitol, the government office that stewards the Capitol and surrounding buildings and grounds. “It takes about an hour of labor for every inch and a quarter of repair. So a 6- or 7-inch crack will probably take one worker a day to repair. But compared to dismantling an entire plate and making a new one, it’s a fraction of the cost."